THESE STANDARD TERMS OF SALE ("TERMS OF SALE") IS AN ELECTRONIC RECORD IN THE FORM OF AN ELECTRONIC CONTRACT FORMED UNDER INFORMATION TECHNOLOGY ACT, 2000 AND RULES MADE THEREUNDER AND THE AMENDED PROVISIONS PERTAINING TO ELECTRONIC DOCUMENTS / RECORDS IN VARIOUS STATUTES AS AMENDED BY THE INFORMATION TECHNOLOGY ACT, 2000. THESE TERMS OF SALE DOES NOT REQUIRE ANY PHYSICAL, ELECTRONIC OR DIGITAL SIGNATURE. THESE TERMS OF SALE IS A LEGALLY BINDING DOCUMENT BETWEEN THE BUYER AND THE COMPANY AND SHALL BE EFFECTIVE WHERE THE BUYER AGREE TO BUY THE PRODUCT SO LISTED ON THE WEBSITE. 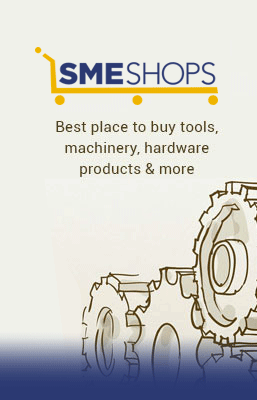 In these Terms of Sale, a user (whether guest user or registered user) who purchase various Products (as defined below) listed on the website located at the URL www.SMEShops.com and mobile application under the name and style "SMEShops" (collectively referred to as the “Website”) is referred to as "Buyer". These Terms of Sale describe, inter alia, the terms of offer for sale/sale, acceptance of offer for sale by Buyer and the purchase of goods and services ("Products") through the Website. These Terms of Sale also contains certain statements and disclaimers made by Power2SME Private Limited (the "Company"), which shall be binding on the Buyer, pursuant to which the Company sells the Products as manufactured by third party OEMs (Original Equipment Manufacturers). Buyer hereby acknowledge that, Company provides an online venue through which Company sell Products to the Buyers however, Company is not manufacturing/producing/designing the Products purchased by the Buyer through the Website and neither does it give any warranty and representation about the authenticity and quality of the Products. In these Terms of Sale, the Buyer may be referred to as "You" with its grammatical variations and cognate expressions. These Terms of Sale are subject to revision at any time and hence the Buyers are requested to carefully read these Terms of Sale from time to time before making any purchase of the Products. The revised Terms of Sale shall be made available on the Website and shall be effective immediately upon being publish on the Website. It shall be Your responsibility to check these Terms of Sale periodically for changes and the Additional Terms of Sale of the OEMs on the Product listing or otherwise. You may be asked to provide Your specific consent to any updates in a specified manner before any further use of the Website and related services. If no separate consent is sought, Your continued use of the Website following such changes and modifications to the Website or these Terms of Sale will constitute Your acceptance of such changes or modifications. If any provision of these Terms of Sale is held to be unenforceable for any reason, such provision shall be reformed only to the extent necessary to make it enforceable and the other terms of these Terms of Sale shall remain in full force and effect. All offer of sale of Products are governed by the description and specifications of the Product, terms of warranties provided by the respective OEMs/ brand owners (as applicable) in addition to these Terms of Sale. In the event a OEMs/brand owners (as applicable) is providing any warranty, details of such warranty will be specified on the relevant Product webpage on the Website or on the label printed on the Product package. Such warranties are provided by OEMs/brand owners (as applicable) and will be fulfilled by the manufacturer/Sellers/brand owners (as applicable). In the event Buyer has any complaints/queries/claim with respect to the Products, including but not limited to quality, specifications etc., the same shall be addressed to the OEMs/brand owners directly without any recourse to Company in any manner whatsoever. The Buyer hereby acknowledges that the availability of the Product shall mainly be dependent upon respective OEMs/ brand owners and therefore, such availability is subject to change without any notice prior to the shipment of the Product to the Buyer. Thus, there may be circumstances where the Product may not be available to be delivered to the Buyer after the purchase transaction. In such an event, Company may cancel such purchase transaction without any recourse to Buyer and without any liability to the Company, unless otherwise provided under this Terms of Sale. The Buyer hereby acknowledges that the selling price of the Products is subject to change without any notice prior to the purchase of the Product by the Buyer. The selling price is provided on the Website on 'as is' basis and due to technical reasons or otherwise there may be errors in selling price which may be corrected by the Company at any time and any acceptance of offer of purchase by the Company of the Products at such faulty selling price shall, subject to the discretion of the Company, not be construed as a valid acceptance and such transaction can be avoided/cancelled by the Company. All prices are exclusive of GST (Goods and Service Tax) unless stated otherwise. There are various delivery models for delivery of purchased Product to the Buyer. The Products ordered shall be delivered by the Company to the shipping address specified by the Buyer while placing the PO. The risk of any damage, loss or deterioration of the Products shall be passed on to the Buyer at the time such Products are delivered to the shipping address of the Buyer. Buyer's shipping address, pin code will be verified with the database of Website before a Buyer proceed to pay for the PO. In the event Buyer's PO is not serviceable by logistic service providers or by the Company or the delivery address is not located in an area that is covered under the order confirmation form, Buyer may provide an alternate shipping address on which the Product can be delivered by the logistics service provider or by the Company. Please note that there is no guaranteed dispatch time and any information about the dispatch time is estimate only and should not be relied upon as such. Therefore, time is not the essence of the bi-partite contract between the Buyer and the Company for purchase and sale of Product on or through the Website. However, the Product shall not be delivered to the Buyer unless the Buyer makes the payment of the purchase of Product. Buyer shall be bound to take delivery of the Products purchased by the Buyer that are said to be in a deliverable state, irrespective of the time of delivery including early delivery of the Products. Where Buyer neglects or refuses to accept the delivery of the Products ordered by the Buyer, the Buyer shall be liable to the Company for such non-acceptance and for any losses incurred by the Company and Buyer hereby agrees to indemnify the Company against such losses incurred and for the loss of profit which the Company and its associated third parties shall have earned if such delivery or transaction should have been completed. Buyer acknowledges that such damages or loss to the Company and its associated third parties are not consequential or indirect. The title in the Products and other rights and interest in the Products shall directly pass on to the Buyer from Company upon delivery of such Product, subject to realisation of full payment by the Buyer tp the Company of all dues relating to the Products ordered. Upon delivery, the Buyer is deemed to have accepted the Products. The risk of loss shall pass on to the Buyer upon delivery of Product. Buyer's Product related complainant for refund or replacement will be processed in accordance with the Cancellation & Return Policy available at http://www.SMEShops.com/info/TrustPay. The Buyer may return the product within 30 days from the date of delivery of the Product and not later than that. The terms of the Cancellation & Return Policy shall be applicable on the Buyer and shall be construed as part of agreement between the Buyer and the Company for sale and purchase of the Products and are included herein by reference. However, in the event of false, frivolous or baseless complaints regarding the delivery or quality of the Products, the Buyer will not be eligible for refund or replacement. Before accepting delivery of any Products, the Buyer shall reasonably ensure that the Product's packaging is not damaged or tampered. The return process of a Product may be subject to additional terms depending on the nature and category of the Product. Any such additional terms may be specified on the Website or be intimated by the Company at the time of purchase of the Product. In the event the return of a Product is duly accepted by the Company, the value of such Product, as originally paid by Buyer during acceptance of Product, will either be refunded to Buyer either to the bank account provided by the Buyer for such refund, or to the payment instrument of the Buyer from which payment was made, or to any pre-paid payment instrument account of the Buyer, subject to Company policies and practice. Cancellation of PO by the Company: In furtherance to the section 1.1 above, Company reserves the right, at its sole discretion, to refuse or cancel any PO placed by the Buyer for any reason whatsoever. Some situations that may result in Buyer's PO being cancelled may include, without limitation, non-availability of the Product or quantities ordered by Buyer or inaccuracies or errors in pricing information. Company may also require additional verifications or information from the Buyer before processing any PO. Any such cancellation shall be without any recourse to Buyer and without any liability to the Company. If Buyer's PO is so cancelled, after the payment has been processed, the said amount will be reversed / remitted to the Buyer either to the bank account provided by the Buyer for such reversal, or to the payment instrument of the Buyer from which payment was made, or to any pre-paid payment instrument account of the Buyer, subject to Company policies and practice. In the event a promotional code given by the Company is used for the purchase of the Product, the amount under such promotional code shall not be refunded in case of return of Products and cancellation of PO. The above stated is the sole remedy of the Buyer and the sole liability of the Company for any cancellation of the Purchase Order by the Company or otherwise other than by the Buyer. Cancellation by the Buyer: In case of requests for PO cancellations, Company reserves the right to accept or reject requests for PO cancellations for any reason whatsoever. As part of usual business practice, if Company receives a cancellation notice and the PO has not been processed, Company may cancel the PO and refund the entire amount to Buyer within a reasonable period of time. Company will not be able to cancel PO that have already been processed by the Company. Buyer agrees not to dispute the decision made by the Company and accept its decision regarding the cancellation. Set-off of any benefits availed by the Buyer: In case the Buyer has availed any benefit under any marketing or promotions offers provided by the Company in relation to the Products for which the PO has been cancelled by the Buyer or by the Company or the Products are returned by the Buyer, subject to Cancelation and Return Policy of the Company, Buyer agrees and authorizes the Company to recover such benefits from the Buyer or set-off the same from any refunds to the Buyer. These Terms of Sale shall be governed in accordance with the laws of India without reference to conflict of laws principles. Both Buyer and the Company agree to submit to the exclusive jurisdiction of the courts at New Delhi, India for disputes arising out of these Terms of Sale. COMPANY'S ROLE IS THAT OF AN ELECTRONIC COMMERCE PLATFORM WHICH PROVIDES AN ONLINE VENUE TO EXHIBIT, ADVERTISE, DISPLAY, MAKE AVAILABLE THIRD PARTY OEM’S PRODUCTS FOR SALE AND OTHER INCIDENTAL SERVICES. COMPANY IS NOT MANUFACTURING/PRODUCING/DESIGNING THE PRODUCTS PURCHASED BY THE BUYER THROUGH THE WEBSITE AND NEITHER DOES IT GIVE ANY WARRANTY AND REPRESENTATION ABOUT THE AUTHENTICITY AND QUALITY OF THE PRODUCTS OR OTHERWISE AND ALSO EXCLUDE ALL OTHER REPRESENTATIONS AND WARRANTIES, WHETHER EXPRESS OR IMPLIED, ARISING OUT OF OPERATION OF LAW OR OTHERWISE. PRODUCT INFORMATION ON THIS WEBSITE SHALL BE MADE AVAILABLE BY THE MANUFACTURERS TO COMPANY. THEREFORE, IN THE EVENT MANUFACTURER(S) UPDATE/CHANGE SUCH INFORMATION WITHOUT INTIMATION TO THE COMPANY, COMPANY WILL NEITHER BE LIABLE NOR BE RESPONSIBLE TO CHANGE PRODUCT INFORMATION OR SPECIFICATIONS TO ENSURE ACCURACY AND COMPLETENESS OF ANY PRODUCT INFORMATION. THE PRODUCTS SHALL BE SOLD ON “AS IS AND AS AVAILABLE BASIS” AND IT IS THE RESPONSIBILITY OF THE BUYER TO ENSURE ANY AND ALL ASPECTS RELEVANT FOR BUYER TO MAKE A DECISION ON THE LISTED PRODUCTS. IN CASE OF ANY CONFLICT BETWEEN THESE TERMS OF SALE AND ANY AGREEMENTS, CONTRACTS, TERMS OR POLICIES BETWEEN THE BUYER AND THE COMPANY, THE PROVISION OF THESE TERMS OF SALE SHALL PREVAIL. COMPAMNY DOES NOT CONTROL, ENDORSE OR ACCEPT RESPONSIBILITY FOR ANY PRODUCT (INCLUDING BUT NOT LIMITED TO PRODUCT CATALOGUES) LISTED ON THE WEBSITE OR ANY LINKED SITES. COMPANY MAKES NO REPRESENTATIONS OR WARRANTIES WHATSOEVER ABOUT, AND SHALL NOT BE LIABLE FOR, ANY SUCH THIRD PARTIES OEMS, THEIR PRODUCTS INCLUDING REPRESENTATIONS RELATING TO MERCHANTABILIGY, FITNESS OF A PRODUCT OR SERVICE FOR A PARTICULAR PURPOSE, AND NON-INFRINGEMENT OF THIRD PARTY INTELLECTUAL PROPERTY RIGHTS. BUYER MAY SUCH THIRD PARTIES’ PRODUCTS ARE AT BUYER'S OWN RISK. THE PRODUCTS SHALL BE SUBJECT TO OEM'S TERMS AND CONDITIONS FOR WARRANTY, SERVICE AND MAINTENANCE, AND COMPANY DOES NOT ACCEPT ANY RESPONSIBILITY FOR THE SAME. COMPANY ALSO DOES NOT ACCEPT ANY RESPONSIBILITY FOR THE USAGE OF THE PRODUCTS BY THE BUYER. COMPANY SPECIFICALLY DISCLAIMS ANY LIABILITY WITH REGARD TO ANY ILLEGAL, INFRINGING, FAKE, DUPLICATE, SPURIOUS, DEFECTIVE OR COUNTERFEIT, REFURBISHED, EXPIRED PRODUCTS PURCHASED BY BUYER FROM THE WEBSITE AND COMPANY SHALL NOT ASSUME ANY LIABILITY IF THE PRODUCT PURCHASED OR AVAILED BY BUYER FROM THE WEBSITE IS NOT EXACTLY AS PER SPECIFICATIONS DETAILED IN THE PURCHASE CONFIRMATION ORDER. BUYER EXPRESSLY ACKNOWLEDGES THAT IN THE EVENT ANY DEFECTIVE PRODUCT IS RECEIVED BY THE BUYER, THE OEM/BRAND OWNER WILL BE RESPONSIBLE TO BUYER FOR ANY CLAIMS THAT BUYER MAY HAVE IN RELATION TO SUCH DEFECTIVE PRODUCT AND COMPANY SHALL NOT IN ANY MANNER BE HELD LIABLE FOR THE SAME. YOU EXPRESSLY UNDERSTAND AND AGREE THAT UNDER NO CIRCUMSTANCES COMPANY OR ANY OF ITS AFFILIATES, EMPLOYEES, DIRECTORS, OFFICERS OR AGENTS BE LIABLE TO YOU OR TO ANY OTHER PERSON FOR ANY INDIRECT, SPECIAL, INCIDENTAL OR CONSEQUENTIAL LOSSES OR DAMAGES OF ANY NATURE ARISING OUT OF OR IN CONNECTION WITH THE SALE OF PRODUCTS, INCLUDING, WITHOUT LIMITATION, DAMAGES FOR LOST PROFITS, WORK STOPPAGE, ACCURACY OF RESULTS, OR IT FAILURE OR MALFUNCTION, NOTWITHSTANDING ANYTHING CONTAINED HEREINABOVE, IN NO EVENT WILL COMPANY BE LIABLE FOR ANY KIND OF DAMAGES IN EXCESS OF THE MARGIN WHICH THE COMPANY MAY RESERVE/KEPT FOR ITSELF VIS-À-VIS PRODUCT/SERVICE, WHICH IS THE SUBJECT MATTER OF A CLAIM.